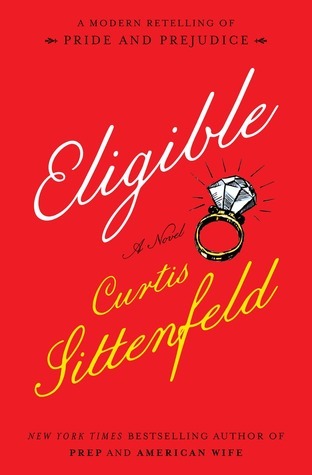 Goodreads says, "From the “wickedly entertaining” (USA Today) Curtis Sittenfeld, New York Times bestselling author of PREP and AMERICAN WIFE, comes a modern retelling of PRIDE AND PREJUDICE. Equal parts homage to Jane Austen and bold literary experiment, ELIGIBLE is a brilliant, playful, and delicious saga for the twenty-first century. This version of the Bennet family—and Mr. Darcy—is one that you have and haven’t met before: Liz is a magazine writer in her late thirties who, like her yoga instructor older sister, Jane, lives in New York City. When their father has a health scare, they return to their childhood home in Cincinnati to help—and discover that the sprawling Tudor they grew up in is crumbling and the family is in disarray. Youngest sisters Kitty and Lydia are too busy with their CrossFit workouts and Paleo diets to get jobs. Mary, the middle sister, is earning her third online master’s degree and barely leaves her room, except for those mysterious Tuesday-night outings she won’t discuss. And Mrs. Bennet has one thing on her mind: how to marry off her daughters, especially as Jane’s fortieth birthday fast approaches. Enter Chip Bingley, a handsome new-in-town doctor who recently appeared on the juggernaut reality TV dating show Eligible. At a Fourth of July barbecue, Chip takes an immediate interest in Jane, but Chip’s friend neurosurgeon Fitzwilliam Darcy reveals himself to Liz to be much less charming. . . . And yet, first impressions can be deceiving. Wonderfully tender and hilariously funny, ELIGIBLE both honors and updates Austen’s beloved tale. Tackling gender, class, courtship, and family, Sittenfeld reaffirms herself as one of the most dazzling authors writing today." A modern Pride and Prejudice retelling? YES! It sounds like a lot of fun. Let's hope this one doesn't disappoint. What do you guys think? I've got this on my TBR list too. I think it sounds fantastic. Great pick! I'm glad you agree, Christina! I thought you might like this one. Thanks for visiting. I heard about this book yesterday. Sounds really interesting.. great choice! Thanks, Ria. I love the premise; let's hope it doesn't disappoint. Thanks for dropping by. YES!! I am so super excited to read this one. I love P&P retellings. :) I really, really hope it is great as well. It's on Netgalley too! Me too, Christy! I am excited b/c I got approved for the early copy on NetGalley. Can't wait to dive in, but I think I'll wait for some warmer weather....seems like a good spring time read. Thanks for visiting! OOOOOH, me too, me too, Christina!! I've recently requested a copy of this one; fingers crossed!! I hope you get approved; it seems like such a fun springtime read! Thanks for visiting, Tara! Sounds like fun! I've only read one book by Sittenfeld (Prep) which was a pretty good read if I recall - but I'm pretty sure the MC annoyed the hell out of me! I heard Prep was a fun book....this one seems to have a different vibe though so hopefully the MC won't get on your nerves. Thanks for visiting, Leanna! I know, right?! I'm glad you agree, Jenny. Thanks for dropping by. Me too....definitely a must read for me! Thanks for visiting, Crystal! Yes! I can't wait for this one as well. Who can resist a P & P retelling? I know! Definitely a weakness of mine...I hope it doesn't disappoint. Thanks for dropping by, Joy! I loved this one and I hope you do too. Curtis Sittenfeld could write the back of a cereal box and I would read it. Great pick! Yay! I am so glad to hear you loved it. I can't wait to check it out! Thanks for visiting, Natalie.